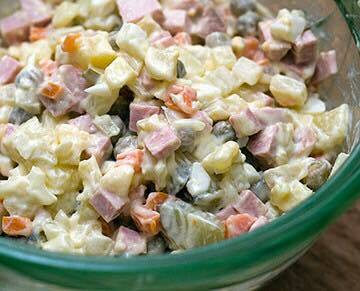 Russian recipe for International week: Russian salad. The cooking process: Potatoes and carrots, not peeled, wash thoroughly, put in a pot with cold salted water. Put eggs as well. Bring it all to boil. Take out eggs in 8-10 minutes (they should be hard-boiled). Continue to cook until vegetables are soft (but not over-cooked). Cool and clean the cooked vegetables and eggs. Peel potatoes and carrots and dice them. Peel and chop the eggs. Also dice sausage and cucumber. Peel and finely chop the onion. Put all the ingredients in a bowl, add salt, pepper, mayonnaise and stir. Sprinkle with fresh herbs. Italian recipe for International week: Tiramisu. Ingredients: 300 g of cookies, 4 eggs. 500g of mascarpone, 100g of sugar, 300 g of coffee and cocoa powder. In the beginning we put the eggs in a bowl, but dividing the yolk from the white part and after that start mixing until it becomes like a kind of foam. While the mixer is moving you can keep adding the mascarpone slowly. After that start adding the sugar slowly as well. The outcome must be thick when it is done. When all of this is done try to make the cream on top well spread. Add on top the cookies and the cold coffee. To the coffee you might add a spoon of sugar. ON top of the cookies add a layer of mascarpone cream. So you add one more level and Voila put it in the fridge for a couple of hours! Preparation: ⁃ in a bowl put the flour. ⁃ In this hole you will put the eggs, and the yeast ⁃ Then gradually you put the milk in and mix the centre of the bowl. ⁃ when it is already well mixed you add the sugar and salt. Under no circumstances can salt touch the yeast. ⁃ When everything is homogeneous you put the butter. ⁃ Here you have to knead with your fingers when you put the butter and that you have to do for a good 5 minutes ( and your dough will stick but less and less that the butter will be incorporated). ⁃ Let your dough rest in the bowl. Make a ball and put a towel on it for a good half an hour in a warm place. ⁃ Then you take it back you incorporate the pearled sugar with it. And you just mix it so that the sugar goes everywhere and not too long otherwise you’ll damage the dough. ⁃ Cover for at least 1h30. ⁃ When it’s done you put them in your waffle cooker 3-5 minutes. Add the wine and lemon juice to the pot and heat until it’s boiled. Lower the heat and gradually stir in the cheeses until they’re melted, stirring all the time. If using kirsch, blend with the cornflour, otherwise use water. Add to the cheese mixture and cook gently until the mixture is smooth – don’t let it boil or it will get burnt. Using the fondue prongs, dip the bread cubes into the cheese and serve.